Demolition work has begun at Heathrow Airport's Terminal 2 as part of a £1bn redevelopment. Terminal 2, originally named Europa Building, was the west London airport's first terminal building when it opened in 1955. The terminal, which handled eight million passengers each year, was closed to the public in 2009. A new building will cater to 20 million passengers when it opens in 2013, airport operator BBA said. The new terminal will be home to Star Alliance airlines. 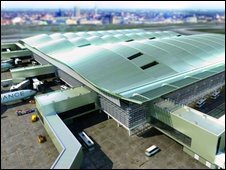 By 2019 the new terminal will extend into the current Terminal 1 site to give a joint capacity of 30 million passengers. Colin Matthews, chief executive of BAA, said: "Heathrow is changing for the better, and there is much still to do. "Our brand new Terminal 2 will offer a better service to airlines and millions of passengers." Last September demolition work began on the airport's Queens Building, which housed offices of the airline companies. Terminal 2 was built at a cost of £21m and designed by architect Frederick Gibberd, who also designed the old control tower, Liverpool's Metropolitan Cathedral and London Central Mosque. The first non-stop flight from Heathrow to California took off from the 49,654 sqm terminal in 1957 and the building served as a port for long-haul flights for a time. But after Terminal 3, also known as Oceanic Building, opened in 1961 long-haul flight operations moved there, leaving Terminal 2 to cater to short-haul flights. In 1977 the terminal was connected to the London Underground network.